"Brotherhood of man" redirects here. For the musical group, see Brotherhood of Man. The first to express this motto was Maximilien Robespierre in his speech "On the organization of the National Guard" (French: Discours sur l'organisation des gardes nationales) on 5 December 1790, article XVI, and disseminated widely throughout France by the popular Societies. 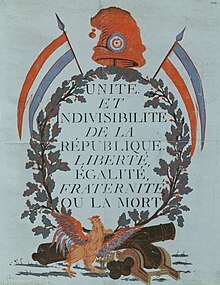 Credit for the motto has been given also to Antoine-François Momoro (1756–94), a Parisian printer and Hébertist organizer, though in different context of foreign invasion and Federalist revolts in 1793, it was modified to "Unity, indivisibility of the Republic; liberty, equality, brotherhood or death" (French: Unité, Indivisibilité de la République; Liberté, Egalité, Fraternité ou la mort) and suggested by a resolution of the Paris Commune (member of which Momoro was elected by his section du Théâtre-Français) on 29 June 1793 to be inscribed on Parisian house-fronts and imitated by the inhabitants of other cities. In 1839, the philosopher Pierre Leroux claimed it had been an anonymous and popular creation. [page needed] The historian Mona Ozouf underlines that, although Liberté and Égalité were associated as a motto during the 18th century, Fraternité wasn't always included in it, and other terms, such as Amitié (Friendship), Charité (Charity) or Union were often added in its place. The emphasis on Fraternité during the French Revolution led Olympe de Gouges, a female journalist, to write the Declaration of the Rights of Woman and the Female Citizen[page needed] as a response. The tripartite motto was neither a creative collection, nor really institutionalized by the French Revolution. As soon as 1789, other terms were used, such as "la Nation, la Loi, le Roi" (The Nation, The Law, The King), or "Union, Force, Vertu" (Union, Strength, Virtue), a slogan used beforehand by masonic lodges, or "Force, Égalité, Justice" (Strength, Equality, Justice), "Liberté, Sûreté, Propriété" (Liberty, Security, Property), etc. In other words, liberté, égalité, fraternité was only one slogan among many others. During the Jacobin revolutionary period itself, various mottos were used, such as liberté, unité, égalité (liberty, unity, equality); liberté, égalité, justice (liberty, equality, justice); liberté, raison, égalité (liberty, reason, equality), etc. The only solid association was that of liberté and égalité, fraternité being ignored by the Cahiers de doléances as well as by the 1789 Declaration of the Rights of Man and of the Citizen. It was only alluded to in the 1791 Constitution, as well as in Robespierre's draft Declaration of 1793, placed under the invocation of (in that order) égalité, liberté, sûreté and propriété (equality, liberty, safety, property — though it was used not as a motto, but as articles of declaration), as the possibility of a universal extension of the Declaration of Rights: "Men of all countries are brothers, he who oppresses one nation declares himself the enemy of all. "[a] Finally, it did not figure in the August 1793 Declaration. The compatibility of liberté and égalité was not doubted in the first days of the Revolution, and the problem of the antecedence of one term on the other not lifted. Thus, the Abbé Sieyès considered that only liberty ensured equality, unless the latter was to be the equality of all dominated by a despot; while liberty followed equality ensured by the rule of law. The abstract generality of law (theorized by Jean-Jacques Rousseau in The Social Contract) thus ensured the identification of liberty to equality, liberty being negatively defined as an independence from arbitrary rule, and equality considered abstractly in its judicial form. This identification of liberty and equality became problematic during the Jacobin period, when equality was redefined (for instance by François-Noël Babeuf) as equality of results, and not only judicial equality of rights. Thus, Marc Antoine Baudot considered that French temperament inclined rather to equality than liberty, a theme which would be re-used by Pierre Louis Roederer and Alexis de Tocqueville, while Jacques Necker considered that an equal society could only be found on coercion. The third term, fraternité, was the most problematic to insert in the triad, as it belonged to another sphere, that of moral obligations rather than rights, links rather than statutes, harmony rather than contract, and community rather than individuality. Various interpretations of fraternité existed. The first one, according to Mona Ozouf, was one of "fraternité de rébellion" (Fraternity of Rebellion), that is the union of the deputies in the Jeu de Paume Oath of June 1789, refusing the dissolution ordered by the King Louis XVI: "We swear never to separate ourselves from the National Assembly, and to reassemble wherever circumstances require, until the constitution of the realm is drawn up and fixed upon solid foundations." Fraternity was thus issued from Liberty and oriented by a common cause. Another hesitation concerning the compatibility of the three terms arose from the opposition between liberty and equality as individualistic values, and fraternity as the realization of a happy community, devoided of any conflicts and opposed to any form of egotism. This fusional interpretation of Fraternity opposed it to the project of individual autonomy and manifested the precedence of Fraternity on individual will. In this sense, it was sometimes associated with death, as in Fraternité, ou la Mort! (Fraternity or Death! ), excluding liberty and even equality, by establishing a strong dichotomy between those who were brothers and those who were not (in the sense of "you are with me or against me", brother or foe). [page needed] Louis de Saint-Just thus stigmatized Anarchasis Cloots' cosmopolitanism, declaring "Cloots liked the universe, except France." With Thermidor and the execution of Robespierre, fraternité disappeared from the slogan, reduced to the two terms of liberty and equality, re-defined again as simple judicial equality and not as the equality upheld by the sentiment of fraternity. The First Consul (Napoleon Bonaparte) then established the motto liberté, ordre public (liberty, public order). Following Napoleon's rule, the triptych dissolved itself, as none believed possible to conciliate individual liberty and equality of rights with equality of results and fraternity. The idea of individual sovereignty and of natural rights possessed by man before being united in the collectivity contradicted the possibility of establishing a transparent and fraternal community. Liberals accepted liberty and equality, defining the latter as equality of rights and ignoring fraternity. Early socialists rejected an independent conception of liberty, opposed to the social, and also despised equality, as they considered, as Fourier, that one had only to orchestrate individual discordances, to harmonize them, or they believed, as Saint-Simon, that equality contradicted equity by a brutal levelling of individualities. Utopian socialism thus only valued fraternity, which was, in Cabet's Icarie the sole commandment. The triptych resurfaced during the 1847 Campagne des Banquets, upheld for example in Lille by Ledru-Rollin. Neither Chateaubriand nor Ballanche considered the three terms to be antagonistic. Rather, they took them for being the achievement of Christianity. On the other hand, Pierre Leroux did not disguise the difficulties of associating the three terms, but superated it by considering liberty as the aim, equality as the principle and fraternity as the means. Leroux thus ordered the motto as Liberty, Fraternity, Equality, an order also supported by Christian socialists, such as Buchez. With the 1848 February Revolution, the motto was officially adopted, mainly under the pressure of the people who had attempted to impose the red flag over the tricolor flag (the 1791 red flag was, however, the symbol of martial law and of order, not of insurrection). Lamartine opposed popular aspirations, and in exchange of the maintaining of the tricolor flag, conceded the Republican motto of Liberté, Égalité, Fraternité, written on the flag, on which a red rosette was also to be added. As soon as 6 January 1852, the future Napoleon III, first President of the Republic, ordered all prefects to erase the triptych from all official documents and buildings, conflated with insurrection and disorder. Auguste Comte applauded Napoleon, claiming equality to be the "symbol of metaphysical anarchism", and preferring to it his diptych "ordre et progrès" ("order and progress", which would then become the motto of Brazil, Ordem e Progresso). On the other hand, Proudhon criticized fraternity as an empty word, which he associated with idealistic dreams of Romanticism. He preferred to it the sole term of liberty. Pache, mayor of the Paris Commune, painted the formula "Liberté, Égalité, Fraternité, ou la mort" on the walls of the commune. It was only under the Third Republic that the motto was made official. It was then not dissociated with insurrection and revolutionary ardours, Opportunist Republicans such as Jules Ferry or Gambetta adapting it to the new political conditions. Larousse's Dictionnaire universel deprived fraternity of its "evangelistic halo" (Mona Ozouf), conflating it with solidarity and the welfare role of the state. Some still opposed the Republican motto, such as the nationalist Charles Maurras in his Dictionnaire politique et critique, who claimed liberty to be an empty dream, equality an insanity, and only kept fraternity. Charles Péguy, renewing with Lamennais' thought, kept fraternity and liberty, excluding equality, seen as an abstract repartition between individuals reduced to homogeneity, opposing "fraternity" as a sentiment put in motion by "misery", while equality only interested itself, according to him, to the mathematical solution of the problem of "poverty." Péguy identified Christian charity and socialist solidarity in this conception of fraternity. On the other hand, Georges Vacher de Lapouge, the most important French author of pseudo-scientific racism and supporter of eugenism, completely rejected the republican triptych, adopting another motto, "déterminisme, inégalité, sélection" (determinism, inequality, selection). But, according to Ozouf, the sole use of a triptych was the sign of the influence of the republican motto, despite it being corrupted in its opposite. The Coat of arms of the French Republic (1905, 1922/1953–) with a ribbon with the motto "Liberté, égalité, fraternité"
During the German occupation of France in World War II, this motto was replaced by the reactionary phrase "travail, famille, patrie" (work, family, fatherland) by Marshal Pétain, who became the leader of the new Vichy French government in 1940. Pétain had taken this motto from the colonel de la Rocque's Parti social français (PSF), although the latter considered it more appropriate for a movement than for a regime. 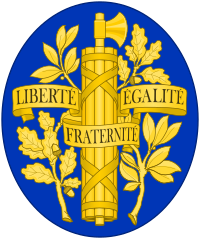 Following the Liberation, the Provisional Government of the French Republic (GPRF) re-established the Republican motto Liberté, égalité, fraternité, which is incorporated into both the 1946 and the 1958 French constitutions. Many other nations have adopted the French slogan of "liberty, equality, and fraternity" as an ideal. These words appear in the preamble to the Constitution of India, enforced in 1950. Since its founding, "Liberty, Equality and Brotherhood" has been the lemma of the Social Democratic Party of Denmark. In the United Kingdom the political party the Liberal Democrats refer to "the fundamental values of liberty, equality and community" in the preamble of the party's Federal Constitution, and this is printed on party membership cards. At one point the motto was put on in 1905, following the French law on the separation of the state and the church, on churches controlled by the French republic, rather than the Catholic Church. The terms are also referred to in the film trilogy Three Colors by Krzysztof Kieślowski. ^ a b c "Liberty, Égalité, Fraternité". Embassy of France in the US. Retrieved 2014-09-18. ^ a b c d e f g h i j k l m n o p q r s t u v w x y z aa ab ac ad ae af ag ah ai aj ak al am an ao ap aq ar as at au av aw ax ay az ba bb bc bd be bf bg Ozouf, Mona (1997), "Liberté, égalité, fraternité stands for peace country and war", in Nora, Pierre, Lieux de Mémoire [Places of memory] (in French), tome III, Quarto Gallimard, pp. 4353–89 (abridged translation, Realms of Memory, Columbia University Press, 1996–98). ^ Robespierre, Maximilien (1950). OEUVRES DE MAXIMILIEN ROBESPIERRE. Tome VI. PRESSES UNIVERSITAIRES DE FRANCE. p. 643. Retrieved 19 September 2014. ^ Latham, Edward (1906). Famous Sayings and Their Authors. London: Swan Sonnenschein. p. 147. OCLC 4697187. ^ de Barante, Amable Guillaume P. Brugière (1851). Histoire de la Convention nationale [History of the National convention] (in French). Langlois & Leclercq. p. 322. Retrieved 31 August 2011. ^ Thacher, John Boyd (1905). Outlines of the French revolution told in autographs. Weed-Parsons Printing Co. p. 8. Retrieved 31 August 2011. ^ Tench, Watkin (1796), Letters Written in France: To a Friend in London, Between the Month of November 1794, and the Month of May 1795, London: J Johnson, p. 15 . ^ "The symbols of the Republic and Bastille Day". French Ministry of Foreign Affairs. Retrieved 2006-04-20. ^ "Bandeiras e significados" [Flags & meanings], História net (in Portuguese), retrieved 2010-10-09 . ^ "Vichy Government". World History. DE: KMLA. Retrieved 2007-05-01. ^ "Federal Constitution". UK: Liberal Democrats. Retrieved 2011-08-22. ^ "Article 1", The Universal Declaration of Human Rights . Wikimedia Commons has media related to Liberté, égalité, fraternité. This page was last edited on 10 March 2019, at 13:46 (UTC).